Eczema can be a miserable condition to deal with and you can try multiple products before you discover one that works for you. Two of the four children have suffered with eczema and whilst it hasn’t been something that has covered their entire bodies as with some cases, it has been hard to manage and distressing at times. Over time we have tried a number of different creams, lotions, and sprays to try and eliminate the eczema. 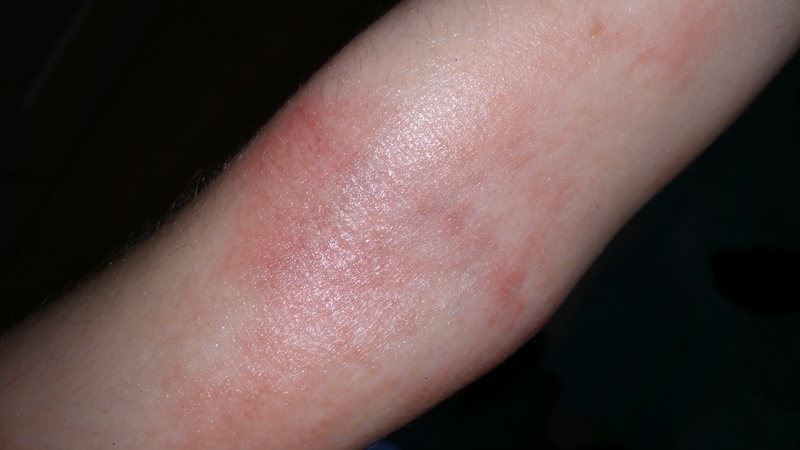 Some have made it worse, some had no effect at all and others have appeared to work for a while but then the skin has reverted back to being red, angry and itchy. We seemed to be going around in circles and not really moving forward. One of the children was especially concerned about summer being on the horizon and being more exposed. I started doing more research looking into alternatives and it wasn’t long before I came across NewGenn and a range of products developed by Dr Harley Farmer. This means that if a cream or any other product is put on the skin, it sits on the surface and all is ok. If a product can get down cracks in the skin which are deep enough for the immune system to detect the product then the body will react in the way it knows how and create inflammation to expel foreign chemicals. These cracks in the skin can be formed even before the skin is noticeably dry and therefore putting products on any skin can potentially cause this reaction. Inflammation is the body’s defence against intruders and therefore a normal response, but it is stopping the skin barrier from reforming. This inflammation won’t stop until what is causing it is removed. This means that if you have had eczema for over a month then any of the products and chemicals that are getting into your skin can be causing it. This essentially means that eczema is a step on from other skin conditions. This could mean a rash or dry skin. The consideration is that when a doctor is visited for a rash they may diagnose eczema say to apply a cream, when this cream is applied it gets into the skin and starts the eczema cycle. Once the products that are maintaining this cycle are removed from the skin then the body usually goes back to normal skin, some people may still have an underlying rash but this wouldn’t be eczema. With these clues eczema can be reframed as Product Maintained Dermatitis, in that a product is being continuously applied to the skin which is causing inflammation and then causing a cycle of damage. If this product is removed then the cycle will end. The NewGen products are designed in a completely different way to the conventional eczema products in that they are high in water content with very gentle cleansing and a humectant included to help the skin. The idea behind them was to create products that are good enough for anyone to use but gentle enough for any skin, obviously including eczema prone skin. We started using the products in April 2015, in two weeks the skin was clear and now seven months on, the skin is still clear. This has been life changing and I am thrilled we have found a long term solution. Whilst this was the case for one of the children, for one of the younger ones it has not been so easy as we have struggled to get him to stop scratching and he didn’t like the consistency of the gel on his skin. The process has taken much longer with him, simply because he was rubbing the product off before it could do anything. We have recently begun trialing a spray version of the product and we have noticed a huge difference. We can make a game out of spraying it on his skin after a bath, he then runs around, which dries the product before getting his PJ’s on. 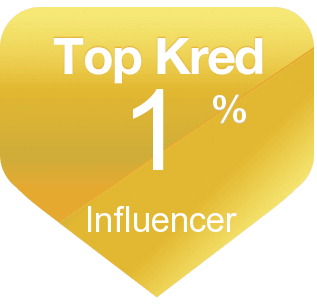 I am so impressed with both the NewGenn products and the knowledge and helpfulness of the staff. We have received some wonderful advice and tips of different things to try along the way and it has all really made a colossal difference to the children’s skin. I must stress that this is about finding a long term solution to eczema, not a quick fix, but if you can stick with the programme the outcome is really worth it. As an additional point, all the products are amazing for treating nappy rash and other skin irritation. On trying this, the nappy rash had gone in 48 hours. 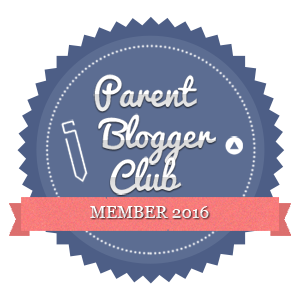 Do your children suffer with eczema? What products have you tried? We have an exciting competition below. 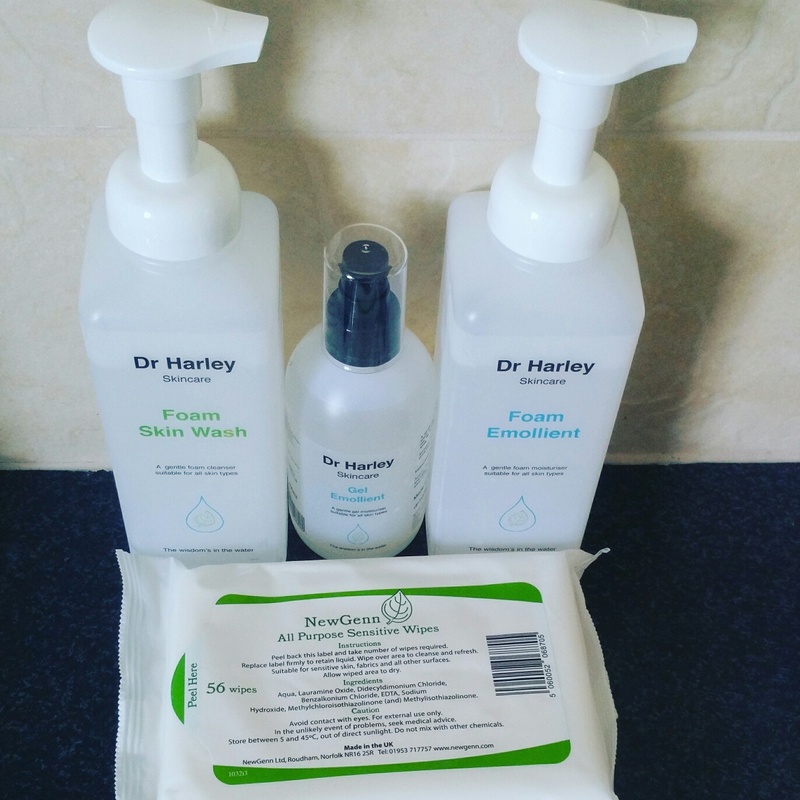 One winner will get a starter pack of Dr Harley Farmer’s products and his book and there will be five further winners who will get a copy of his book to help banish eczema. Just enter the easy widget below. Congratulations on beating eczema and thank you for your wonderful words. The bit I liked most is how you turned ending eczema into fun. Everyone who has had to tolerate eczema knows how rarely the word fun comes to mind. I smiled when Rob said he was sending you a one-off spray to overcome one individual’s response to a foam — both products contained the same liquid but your son’s response was what we wanted to see. It brings us great joy to learn of more children freed from the misery of eczema. It brings even greater joy when we see fun added to the journey. 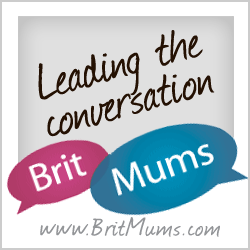 I believe your wonderful successes will encourage other Mums to share that joy and liberate their children. Let’s all have a LOT of fun! Thank you for the lovely comment – the spray changed everything! Amazing. I can’t thank you enough. Both the children are so happy and relieved and the results have been amazing. Thank you again! My 5 year old has really bad eczema, so I would keep it and use it on his! Charlotte suggested I reply to your question. The “cure” for eczema lies in knowing what eczema is and how to avoid it. Our products which she used so effectively are very gentle skin cleansers and you need to have done certain things to correct the imbalance in skin before they can help. This is explained in my book on dr-harley.com and a much shorter summary can be found in the brochure you can download from the ‘7+3’ button on that site. If you want to discuss this direct email me on drh@dr-harley.com and be ready for a fun ride to no more eczema. That is really generous of you. Christmas is coming and if that’s relevant for you imagine how you will feel when those you share this gift with end their eczema in January! That wonderful feeling is one I’ve enjoyed many times in recent years and I delight in sharing it with others. I hope you gain the same. Having eczema from birth is sadly too common. I’m really happy you are there for your boy and looking out for answers like this. If you want personal assistance please email me direct on drh@dr-harley.com – we always have time for those who care as you have seen in Charlotte’s wonderful blog post.. I would keep it for myself as i have bad eczema! These products came about because I’ve always had incredibly sensitive skin too. For decades I kept trying everything I could find and eventually made products which suited me. I recall a time when mothers I had never met rang me saying how nice it was that I had ended eczema in their children. That surprised me as I was not working with children at the time. You will find the story in my recent book on dr-harley.com. I look forward to hearing of your success in ending your eczema. Contact me direct if you want as everyone has something new to offer and I love to listen. All these products are FDA compliant and can therefore be sold in the USA. We are actively seeking an American licensee to serve your 30,000,000 eczema sufferers and once they are in place the products will be sold in the USA. Until then we are selling to you via our UK shop at uk.dr-harley.com which sadly means quite high shipping costs across the Atlantic. If you know anyone who wants the licence please have them visit dr-harley.com and check the Licensee button to find a spreadsheet for them to evaluate their opportunity. I only want ONE exclusive licensee to handle the brand in the USA. The only proviso is they have to convince me that they put people before profit. I have walked away from people who just want the money and intend to keep doing it until the right team appears. Also please be aware that the products are very special mild skin cleansers; the cure lies in the knowledge within the book including the three clues Charlotte listed in her blog post. You are right. We look forward to hearing from you. One of the greatest skills lies in finding the questions – only then can you see answers that are out there. I’ve used that skill for a long time which is why I’ve located questions many others fail to ask and found answers you can use. Contact me on drh@dr-harley.com if you want to discuss details. Please contact me direct on drh@dr-harley.com if you want to discuss details. My husband has eczema and usually smothers himself in Vaseline and that seems to work for him. If we could try this he might find it clears up better/quicker than using Vaseline. The second of the clues Charlotte mentioned in her post has special relevance here. Vaseline has a role in MANAGING eczema whereas we are talking about ENDING eczema. Once your husband reaches that stage of ending his eczema he won’t need Vaseline or any products to manage eczema as there won’t be any eczema. He may still require assistance with dry skin and that’s a lot easier than eczema. I would try these myself. This would be a chance to try something different on my daughter’s skin. I would try use this myself. I think these would be great for my sister in law! My brother suffers terribly from this- especially at the moment in the cold weather. I would try it for myself. My Mother In Law suffers from eczema so badly that she often writhes in agony and we think that it may have caused her to have a heart attack as it happened in the middle of one of these episodes. The medical profession aren’t helping but this seems to be something that might make a difference thanks for highlighting it. I’d be desperate to give these to my husband to try out – his eczema really gets him down sometimes a sits hard not to be able to help. My nephew is 6 months and has come out in an eczma like rash. His daddy has soraosis sorry about the spelling so hope it’s not that. Is there any way to tell this young if it’s just eczma? And are these products suitable? I would keep these for myself – my eczema causes me so much grief and dictates what I wear and where I go and I’d love to break the cycle.